Kevin Harvick adds UFC star Miesha Tate to group KHI management. She is to fight Rin Nakai on Sept. 20 in Tokyo, I can't wait for that fight. Weigh ins for Miesha's match tomorrow against Jessica Eye. Flexes by both. Weigh-ins for UFC 196 tonight, including Miesha's usual hot flexing at 28 seconds and Holly's not so much at 1:10. Yup... plus Miesha and Holly know each other very well. Holly metaphorically snuck up on Ronda pretty much and she never knew what hit her. Miesha has become quite the intelligent fighter and and in no way was going to make the same mistake Ronda did against Holly. That being said as you mention, "styles make fights", Ronda will always be a tough match up for Miesha. If they fight a third time, and they probably will, Ronda will still be made the favorite to win, even with Miesha being the champion. I think Tate can beat Ronda, especially if she gets that same rear naked choke on her, but getting to that is what makes this match up so tough for Miesha. Ronda's judo style enables her to defend that better than Holly could. Miesha may want to keep the next fight on their feet. 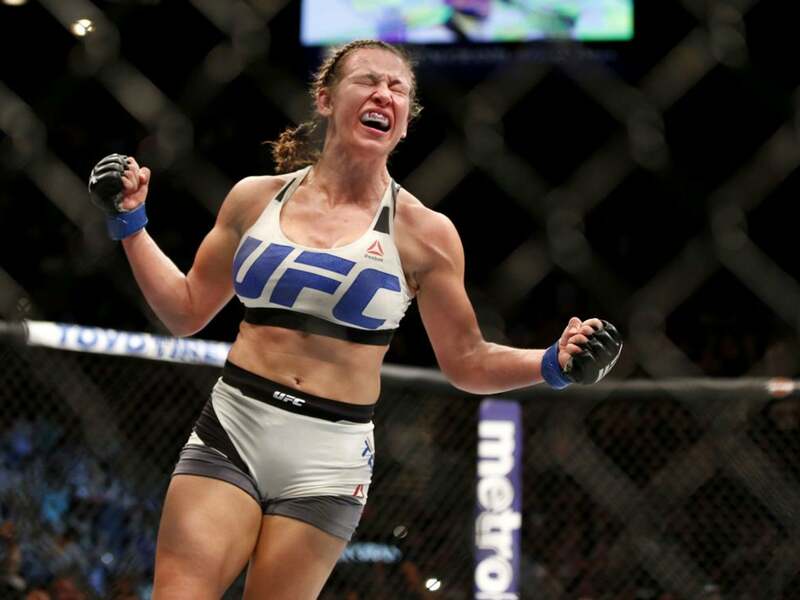 Obviously her boxing skills are not Holly's, but they have improved enough, while Ronda has shown how poor she is right now at defending that style, that may be the way for Miesha to go. Get the fight into the 4th and 5th rounds where she gets stronger and that is virgin territory for Ronda and Miesha will finally get that Rousey monkey off her back. Exactly. If you remember the last time Miesha and Ronda fought, Miesha did get Ronda into the choke, but Ronda worked out of it. She's got great knowledge for defending submissions and then turning that around to get a submission on her own. Miesha would definitely be better off standing with Ronda. Plus I don't think Ronda can change that attacking style of hers. So if she doesn't get Miesha by Round 3, she will tire. Just like Conor did. And that's when Miesha's patience can pay off. Amazing, this third fight is actually marketable now! Holm looks much smaller and less muscular than when she fought Rousey.